Half-way January… childishly eagerly awaiting the mailman… The beast is arriving! Ding-dong! Hi mailman. Big box. Yeah. Boats in there. Boats? Yeah, never mind. Bye. Unwrapping. 2 boats. Yeah, one small boat for Joery, one big boat for us. Yellow blinking. Unfolding. Wooooow. How to inflate this thing? Oh, a bellow bag. Handy. That’s fast. Heart pounding. This is exciting. When can we go out to tame the beast! Lazy sunday… Forecast predicts freezer temperatures for the coming week. Just before the water loozes its fluidity for a week or more, we go out for a couple of kms from our house and find a perfect spot for baptising the beast in an old cut-off meander of the mighty Schelde. Sunday joggers and passing mountainbikers put up a crazy frown. No it’s not E.T. phoning home, it’s 2 crazy Belgians going for a first float. Why the hell an inflating boat? For us it’s a natural continuation of our wilderness travels. While backpacking in remote areas, we always are most afraid of crossing hurling waters. This is the safe answer. In stead of walking for days around the fjord, we can now cut it off… Backpacking is not only hiking, it does not stop on fluid boundaries. This is walking on waters. Float. Be free. 2.6kg for a 2-person boat. That’s 1.3kg per person. For the weight of a tent, we become amphibians. 1 kayak paddle. 4-piece. 2 pieces makes a blade for each of us. Paddling canoe style, that’s where we are going. A big thumb for Sven, from Packrafting.de. He did an excellent job in handling all business with Alpacka Rafts, clearing customs and providing us with all necessary advice in how to start with this thingy. Finishing Roman’s bible. It’s a splash. The unrigged explorer. It’s on. The ice is broken. Now we have to load our beast with our gear. Stay tuned. 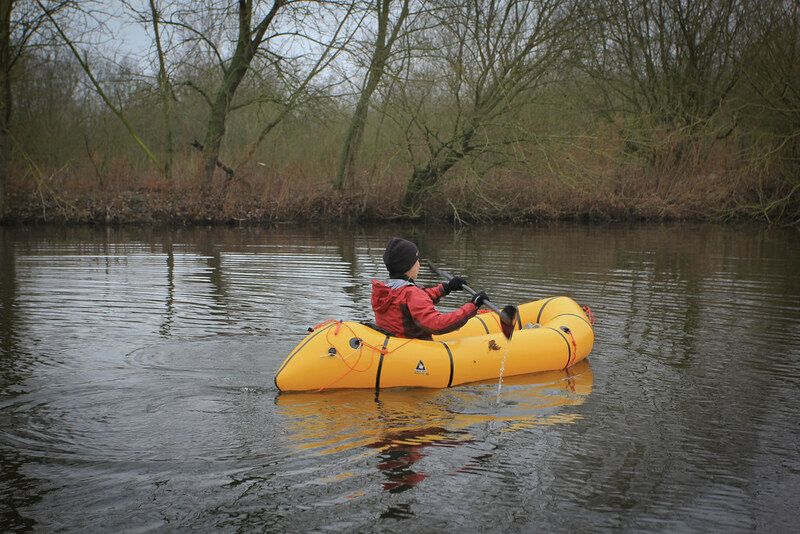 This entry was posted in Gear, Packrafting and tagged alpacka rafts, field test, packrafting. Bookmark the permalink. Rejoice! Haven’t baptiseded mine yet but it’s here. Secretly wishing away winter already. Nice! I’m hoping to pick one up this year as well. Until then, its fun to watch other people enjoy theirs! I’m looking forward to seeing footage from real adventures. Eagerly awaitig your frst packrafting trip report! 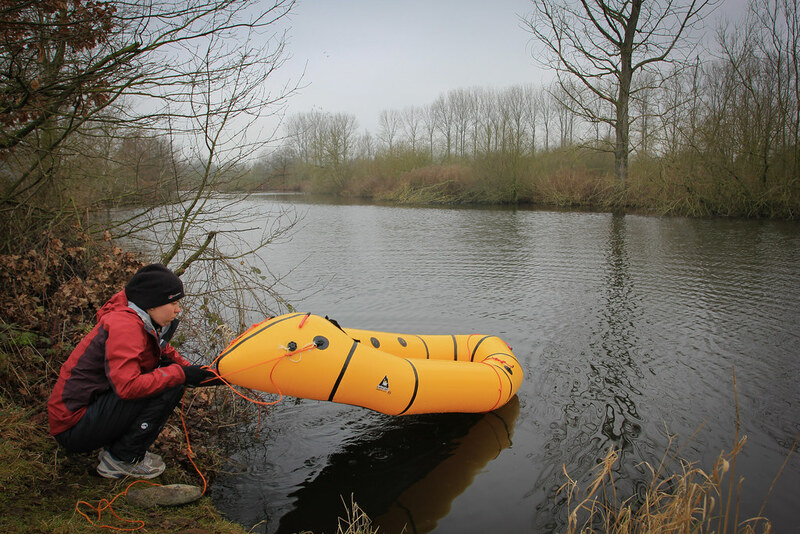 As soon as you feel ready for a trip on the Nete river or any other slow river here in Flanders, just shout. By the way, I think you should try to hold the inflation bag lower while inflating. Now you squeeze a lot of air out of it what is doubling the inflation time. Have you tried with Katrijn sitting with here back towards the paddle direction (so opposite like in the movie)? How was that going? The unrigged explorer looks great! We’ll do some more first gentle paddles (with pack), and then we’re on for a Nete-trip! Deal! We tried the face-to-face position, but then there’s only 1 who can paddle, because it makes canoe style a bit more of synchronous thinking difficulties… we’ll see what happens on prolonged trips. What a joy to watch you guys 🙂 Good choice with yellow. Makes these grey days so bright. I am very curious how you end up in positioning as a double. There is sure more then one way, or as Luc calls it: the Kamasutra of Packrafting: http://thingstolucat.com/ks-packrafting/ Go on, it needs to be promoted! Apart from that, I really like the ‘Walk on Water’ theme, good expression on your philosophy. Also the telegraph style of writing in this post shows your deserved excitement. Tx again Sven! You’re the European packrafting guru. What is the music in this great video?? The music in the video is by Youth Lagoon!